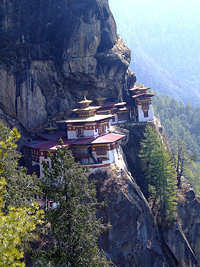 The first stop after leaving Thimphu is the Dochula Pass at 10,500 ft. site of one of Bhutan's most enchanting views. If weather permits the breathtaking peaks of Bhutan's Northern border can be viewed, in season it is a magnificent canvas of color- a profusion red, pink, white, yellow and purple rhododendron blossoms splashed among the soft green of wild herbs and forest trees. At the top of the pass is the newly built “Druk Wangyal Khangzang Chortens”, a unique cluster of 108 Namgyel Khangzang Chortens that spiral up to the main monument Chorten. This is a tribute and monument to the selfless service and visionary leadership of His Majesty the King. After stopping for lunch in the village of Sopsokha, you can walk across the rice fields up to the important Chimi Lakhang temple, where childless women go to receive blessing from the Lama Drukpa Kunley, in whose honour the temple was built by his cousin in 1499. Blessed with a temperate climate and drained by the Phochu and Mochu rivers, is the fertile valley of Punakha. After checking in at your hotel, you can relax or take an optional hike to enjoy the country. Today you will visit the beautiful Punakha Dzong. 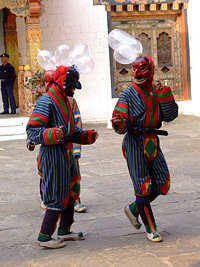 Before Thimphu was made the capital of Bhutan, Punakha was the winter capital because of its milder climate. Today it is the winter seat of Je-Khenpo (the Chief Abbott) and the Central Monk Body. 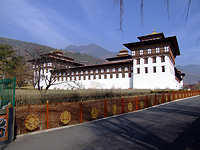 The stunning Dzong (fort) built at the junction of the Phochu and Mochu Rivers in 1637 by the first Zhabdrung of Bhutan, Ngawang Namgyel, served as both the religious and the administrative center of Bhutan until the mid-1950s. After the visit to the Dzong, you will drive to Wangdue. 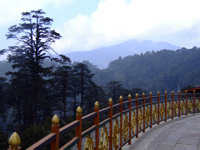 Wangdue is a small town located on a ridge that plunges into the Puna Tsang River flowing below. Sitting atop the ridge with a commanding view of the valleys below is the Wangdue Phodrang Dzong which you will visit after taking lunch in a local restaurant. 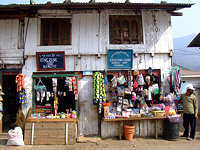 The town market square in Wangdue is a lively and colorful place to stroll before returning to Punakha. Day 5: Punakha - Paro. After breakfast, drive across the pass back to Paro. Visit Ta Dzong, the National Museum housed in an ancient watchtower, which has a fine collection of ancient Thangkha paintings, textiles, weapons and other artifacts; then visit one of the most celebrated Dzongs in Bhutan, the Rinpung Dzong, or 'the Fortress of the Heap of Jewels'. The perfect introduction to this beautiful country!